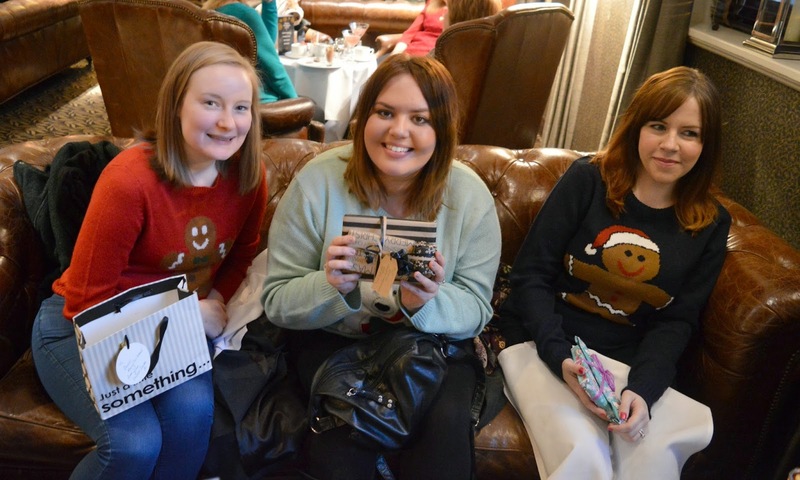 My little blogger's cake club in the North East has been running for 5 months now and to celebrate we decided that December's club should be something special. 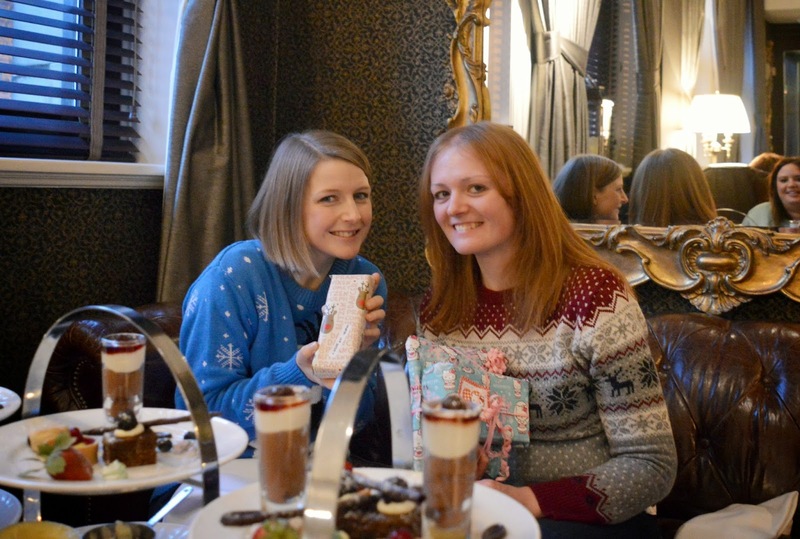 We usually find ourselves in small tea rooms across the region but Christmas time is always a great excuse to do something different so we put on our Festive jumpers and headed to the Vermont Hotel for a Festive Afternoon Tea. The Vermont has been mentioned on my blog a few times before - Simon and I had drinks on the Sky Lounge roof bar back in the Summer, we've had a couple of evening meals in the brasserie and it has become my bar of choice to have a quiet drink when I want a comfy sofa in a peaceful environment. 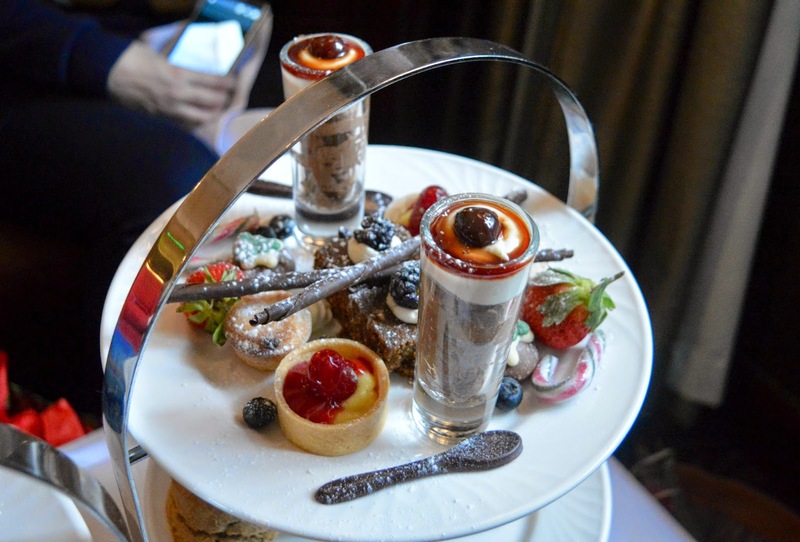 However, this was my first Afternoon Tea at the Vermont so I was looking forward to trying out somewhere new and sharing a properly indulgent afternoon tea with the girls. 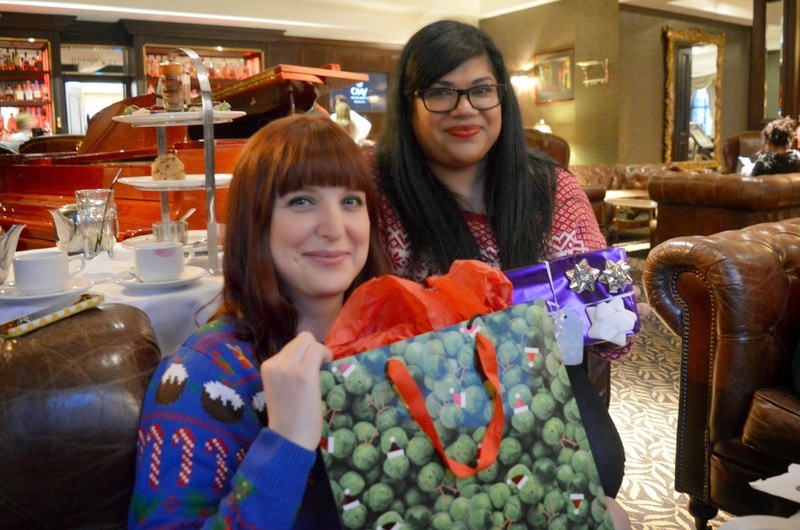 Our tea was taken in the Redwood Bar which looks so beautiful at Christmas. We were lucky and had a prime table next to the roaring fire which had a traditionally decorated mantelpiece. If there's one thing I love at Christmas its a festive fireplace! We also found ourselves next to the piano and I was secretly hoping that someone might appear to play some festive tunes but unfortunately it never happened. I was tempted to tinkle the ivories myself, but I wasn't sure that the rest of the bar would appreciate a rousing rendition of "chop sticks". 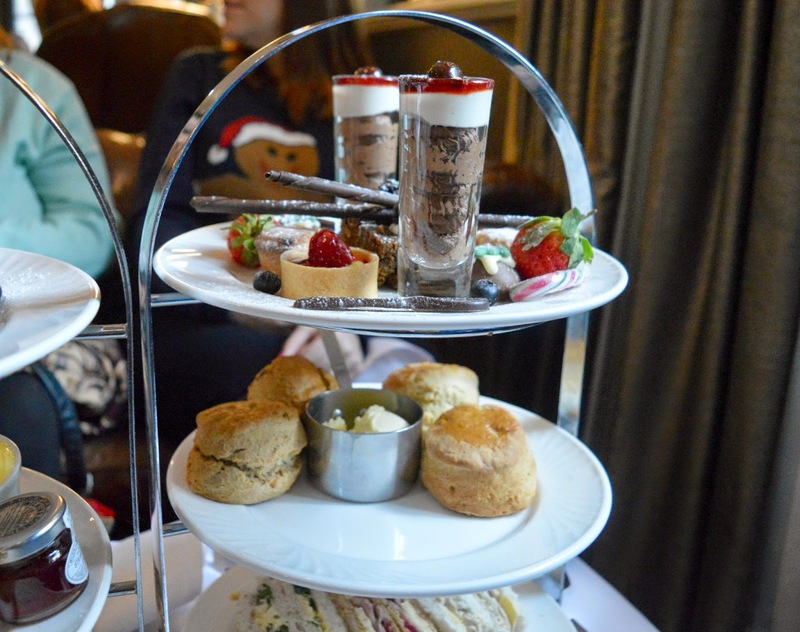 This was the first time I'd ever had this type of afternoon tea in such a large group. There were 7 of us in total and our little table really struggled to fit all of the cake stands, teapots, jugs of milk and sugar pots. It was a little bit of a mission moving around the table without knocking things over. 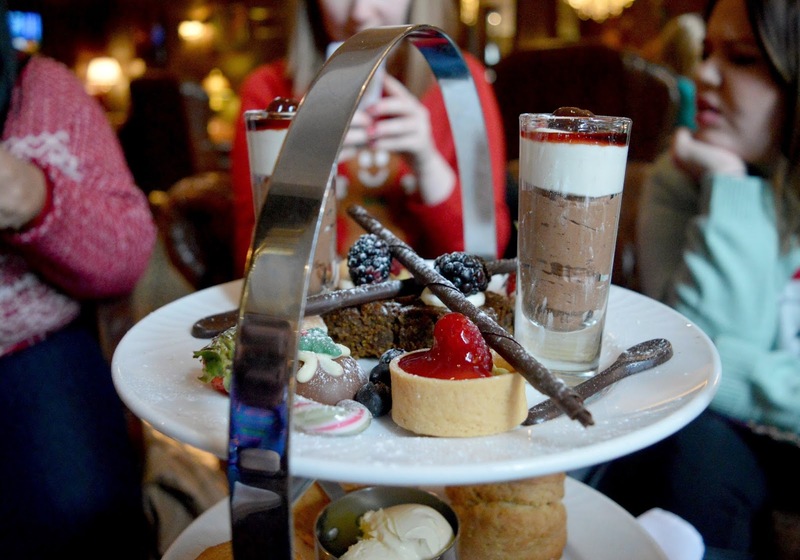 Festive Afternoon Tea is served at the Vermont through December and costs £14.95 which is fantastic value for the amount of food that you get. I loved the Festive twist on the classic cake stand and really appreciated the effort that the hotel had gone to. They were also very accommodating with my nut allergy, giving me my very own "nut free" cake stand. I usually race through the sandwiches to get to the cake, but these bad boys were worth taking the time over. The bread was soft and fresh and the fillings were generous with a special little nod to Christmas. We enjoyed Salmon and Cream Cheese, Turkey and Stuffing, Bacon and Brie with Cranberry (my personal favourite) and Egg and Cress (maybe not the most festive of flavours but delicious nevertheless). As it was Christmas it was only right to have a little tipple with our savoury tier and we were each given a glass of mulled wine which put us completely in the mood for Christmas. We were served two scones each which almost made me want to fist pump the air. I've been getting quite frustrated recently at afternoon teas only serving one scone per person .. yes maybe I am greedy but I do like to be given the option to eat two! The plain scone was lovely but the real star of that tier was the fruit scone that was given an extra Christmassy boost of cinnamon. Before making it to the top tier we decided we were in need of a breather as we were beginning to feel very full. Following on from my earlier debate about scones it is ALWAYS a mistake to eat both, but even so it's completely necessary to do it anyway. Everyone's presents were very well thought out and there were lots of smiling faces as we ripped open the paper. Shivani was my secret santa and she got me a box of chocolates (I think everyone knows how much I LOVE chocolate at Christmas) and the most beautiful hanging tota birds from her recent trip to India. After all the excitement we just about had room to carry on with the cakes and tucked into the goodies on the top tier. We had a shot of chocolate and cherry mousse (complete with a chocolate spoon to eat it with), mini mince pies, a very rich and spicy gingerbread cake and mini cheesecake as well as some peppermint candy canes and strawberries. I think I'm probably the only person who managed to polish all of mine off! We had a fantastic afternoon telling each other funny stories and chatting about Christmas. The time flew and it was lovely to be in the company of my favourites ladies in the North East. It seems so odd that a year ago I hadn't met any of these girls and now they are my closest friends in my new home. I feel very lucky to have met them all this year - If you can't be sentimental at Christmas then when can you eh? Afternoon Tea at the Vermont gets a thumbs up from me, and I'm sure I'll be heading there again next year as poor Simon is a little sad that he missed out!